It’s been a couple of weeks since I finished my first ever Whole30 challenge, and I’ve been feeling great! During the Whole30 program meals center around meat, seafood, eggs, tons of vegetables, some fruit, and plenty of good fats from fruits, oils, nuts and seeds. Foods that are off-limits include added sugar of any kind (this includes maple syrup and honey), alcohol, grains (including wheat, rice, oats, corn, quinoa), legumes (beans, soy, lentils, peanuts), dairy, corn and white potatoes. Meal 1: Scrambled eggs seasoned with Wildtree’s Rancher Steak Rub. 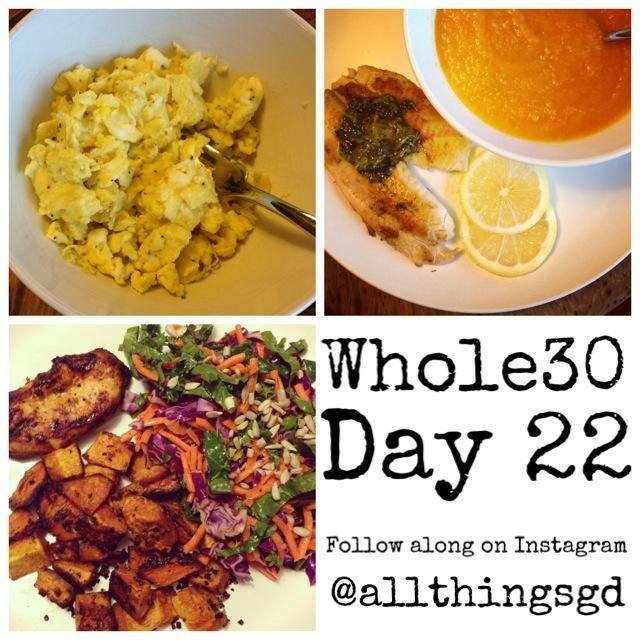 Meal 2: Pan-fried tilapia with cilantro butter (ghee) and Spiced Butternut Squash & Apple Soup. Meal3: Wildtree’s Chipotle Lime Grilled Chicken, Butternut Squash roasted with Wildtree’s Garlic & Herb Blend, and Kale Slaw with Red Cabbage and Carrots. Meal 1: Sweet potato hashbrowns seasoned with Wildtree’s California Style Garlic Pepper Blend, topped with 2 eggs – my favorite breakfast during this entire challenge! Meal 2: Wildtree’s Chipotle Lime Grilled Chicken and Kale Slaw with Red Cabbage and Carrots. Meal 3: Paleo Buffalo Chicken Sweet Potato Skins. Meal 1: Spiced Butternut Squash and Apple Soup. Meal 2: Garden salad from a local cafe. Meal 3: Tilapia fish lettuce wraps with smashed avocado, and Kale Slaw with Red Cabbage and Carrots. Meal 1: Bacon, Kale & Scallion egg frittata seasoned with Wildtree’s Rancher Steak Rub. Meal 2: Paleo Buffalo Chicken Sweet Potato Skins. Meal 3: Wildtree’s Lemon Pepper Shrimp and the last of my Kale Slaw with Red Cabbage and Carrots. Meal 1: Brussels sprouts with bacon. 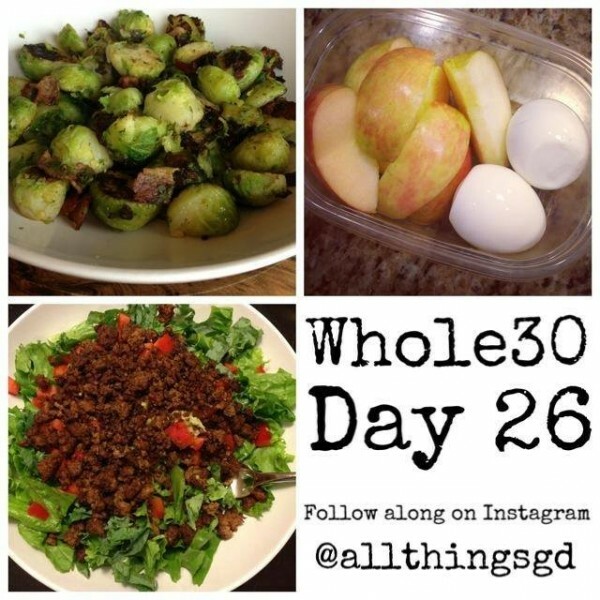 Meal 2: My quick and easy go-to meal for when I’m on-the-go – hard-boiled eggs and apple slices. It’s not fancy but it gets the job done! Meal 3: Wildtree’s Lemon Pepper Shrimp with homemade kale chips. Meal 1: Sweet potato hashbrowns seasoned with Wildtree’s California Style Garlic Pepper Blend, topped with 2 eggs. Meal 2: I was so busy on this day that I didn’t get a chance for a real lunch. Luckily a handful of almonds tided me over until dinnertime. Meal 3: A roasted a chicken in the crockpot, shredded it and topped it with some hot sauce for a quick dinner fix. Meal 2: Another lunch on the go. This time I hit up a grocery store salad bar and loaded it up with veggies, hard-boiled eggs, and guacamole for dressing. Meal 3: Chicken Bacon Alfredo with Spaghetti Squash – one of my favorite new recipes from this challenge! Meal 2: Brussels sprouts with bacon. Meal 3: Chicken Bacon Alfredo with Spaghetti Squash. Overall I feel fantastic and am so glad I gave the Whole30 a try! I lost 7 lbs which I thought was incredibly impressive considering I ate a lot, never felt hungry and didn’t work out a single minute. In addition, I’ve been getting compliments on my skin almost daily, my energy levels are back on track (no more afternoon slumps!) and my hunger is stable – no more Code Red Situations! I’m not sure that I’ll be doing a 100% Whole30 or Paleo diet going forward, but this challenge has definitely changed my eating habits. 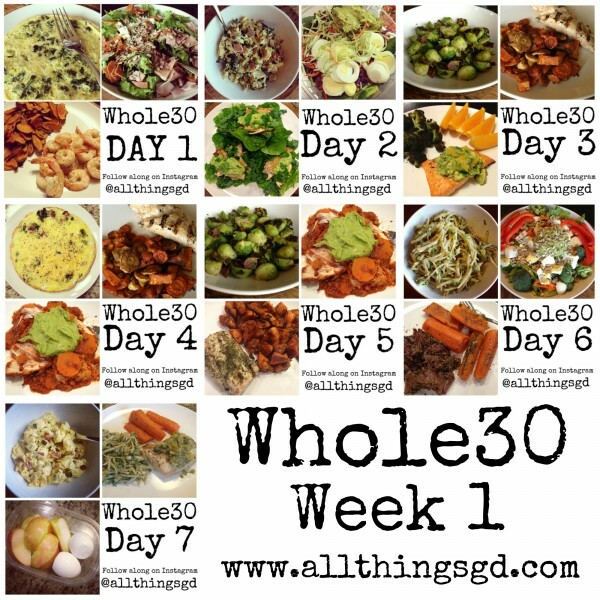 I’ve welcomed wine back in (obviously), but I’m now trying to eat gluten free – something that seemed absolutely impossible to me prior to doing Whole30. 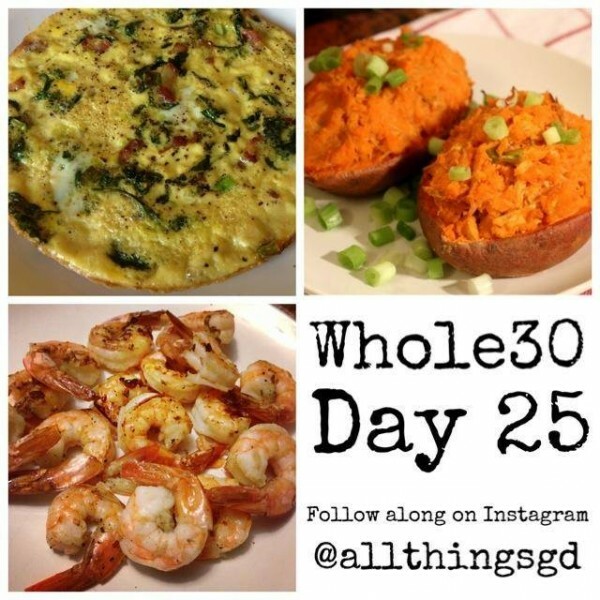 My diet since finishing my 30 days still centers around protein and vegetables, and I’m continuing to find and try new Paleo recipes to add to my arsenal to keep my taste buds interested and on track. 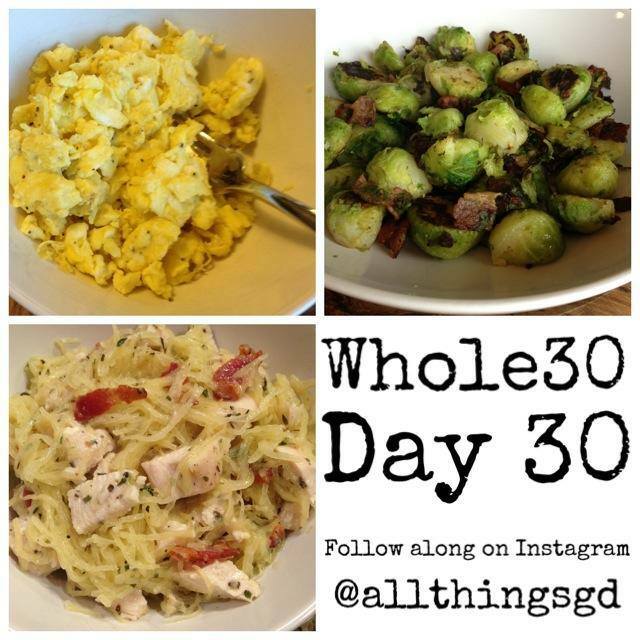 I’ve relied heavily on Wildtree’s all natural line of blends and seasonings to get me through these 30 days, and am currently developing a Paleo and Whole30-compliant freezer meals workshop, as well as assembling loads of Paleo Wildtree recipes to keep me going and make staying on track as easy as possible (as well as save myself time in the kitchen). 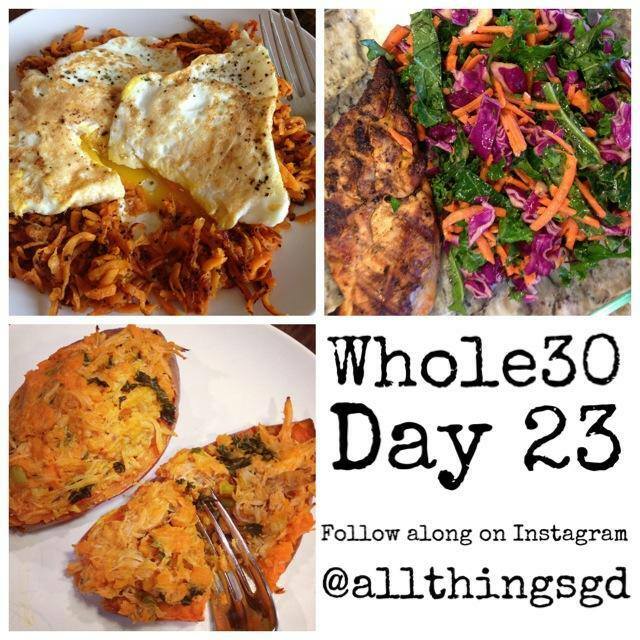 If you’ve been considering giving Whole30 a try, I highly recommend it, and I’m happy to answer any questions you have! I eat gluten free when I’m marathon training or as gluten free as possible. I don’t know how I would survive without quinoa in my diet! I don’t think that I could commit to any diet plan where that was an off-limits food. But to each his own! 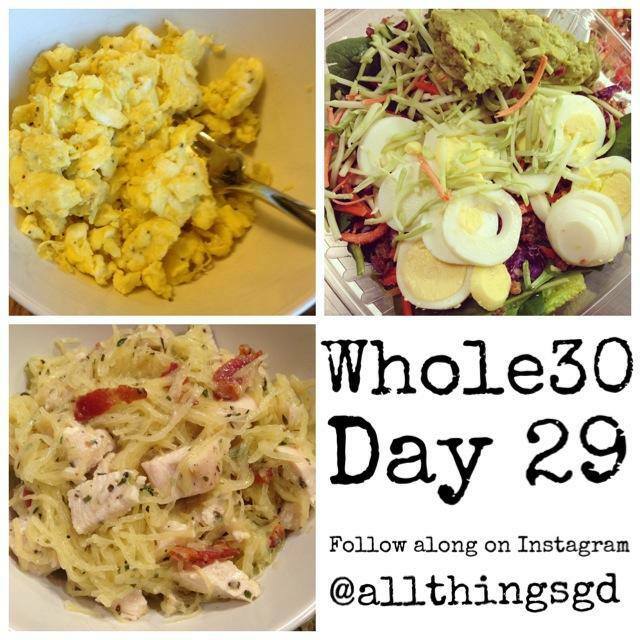 Congratulations on finishing your 30 day challenge and it sounds like this was really good for you. Thanks Heidi! 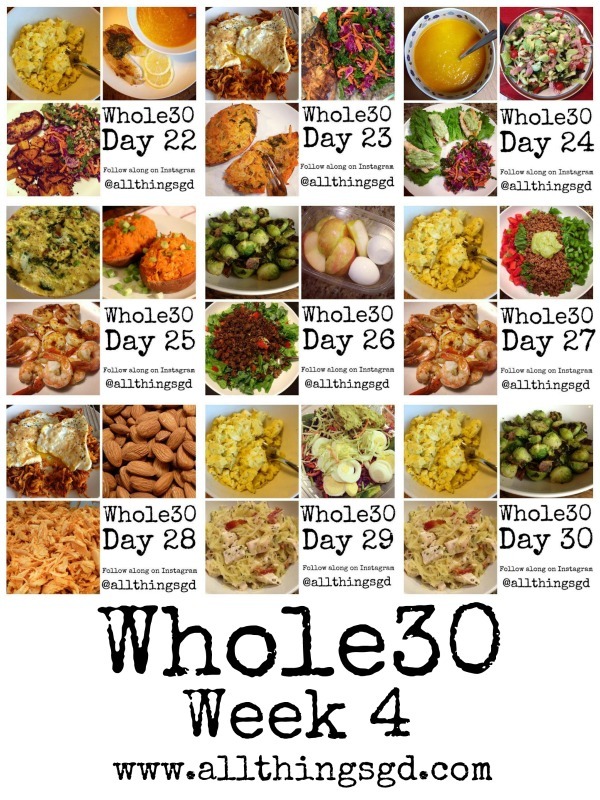 I love quinoa too, but surprisingly enough I haven’t been missing it since I’ve started Whole30. Good luck with your training! It’s sooooo good, Karen! Let me know what you think if you give it a try! Thank you, Jill! I just peel a sweet potato and shred it with the grater attachment of my food processor. Then I melt some coconut oil in a skillet and cook it in that. I add Wildtree’s California Garlic Pepper Blend for seasoning and it’s amazing! I made it this morning and it was OUTSTANDING! 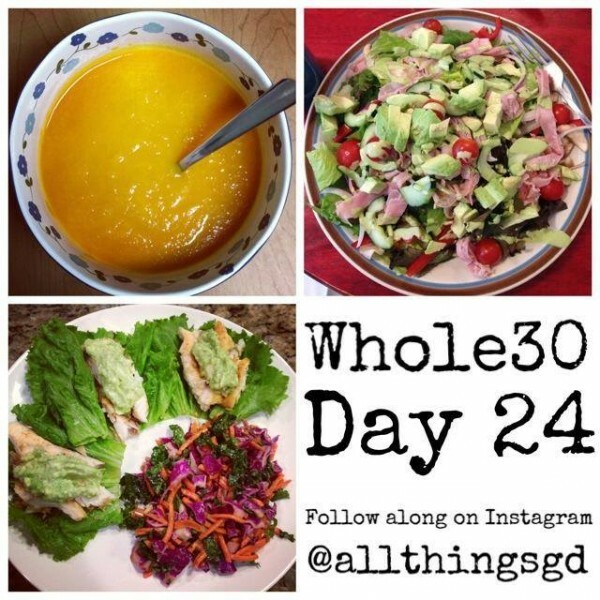 Your recipes are really helping out, thank you so much for the work you do to document and share them with us!! Just finished day 4!! Oh yay! I’m so happy to hear you liked it, Jill. Sounds like you’re off to a great start with your Whole30!! Hi Amber, I never actually calculated my fat vs protein vs carb ratios – I just ate. It’s possible I may have been low on fat, but it wasn’t intentional. 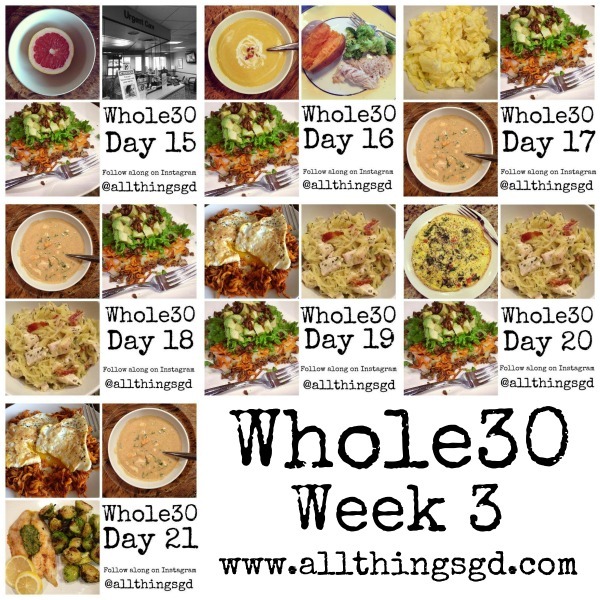 I used a lot of fats when I cooked, and I’m certainly not scared to eat them – bring ’em on! 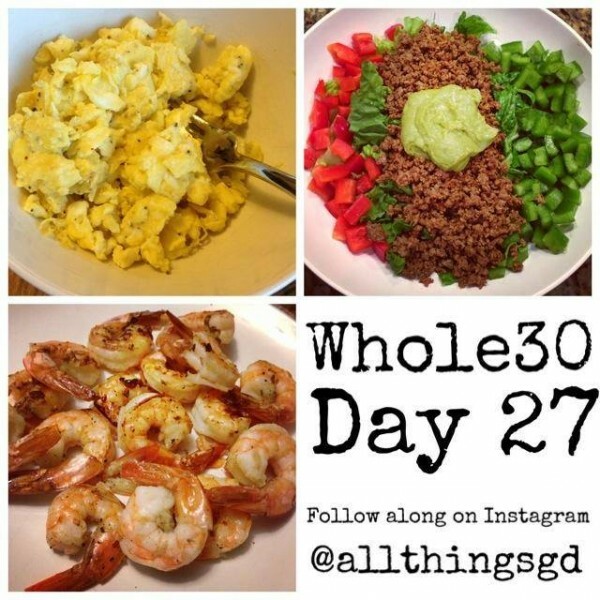 I’m curious to know if this has changed how you eat now that you have been off it awhile? And would you do it again? It has. I’ve continued to stick to a diet of primarily protein and veggies. I rarely eat grains and when I do I try to go gluten-free. I’ve also stayed dairy-free with the exception of the occasional cheese. 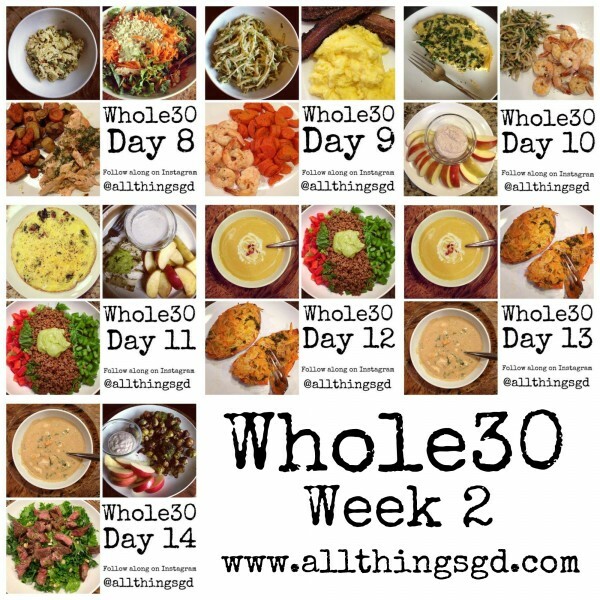 G decided he wanted to give Whole30 a try but he didn’t want to do it alone, so I’m actually already on my second one! Hi I was wondering what salad dressing you use with your salads. 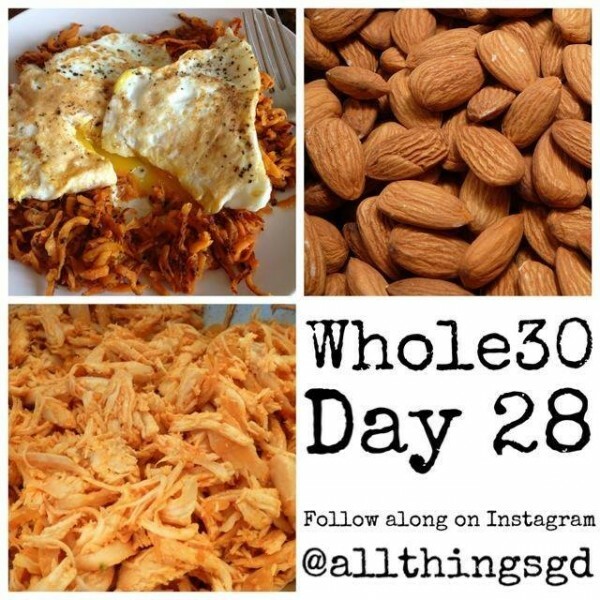 I’m having a hard time finding something whole 30 compliant. Thx! !